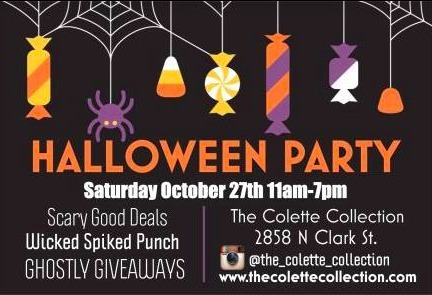 Come to join me at The Colette Collection’s Halloween Party on Saturday, October 27th. I will be signing and selling copies of my book, A Girl’s Guide to Chicago from noon to 3 pm. I will be having a special promotion for my book which is a perfect gift for the holidays! Come to shop some scary deals and have some fun with us! For more information click here or here. Hope to see you there!